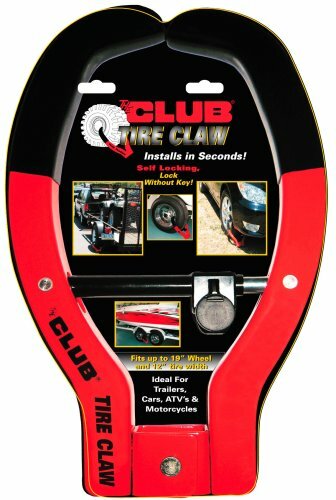 The Club 3000 Twin Hooks Steering Wheel Lock is a part of The Club line of quality products by Winner International. Prevent professional thieves and joy riders from taking your vehicle with The Club Twin Hooks. The Club Twin Hooks locks on to the steering wheel, making the vehicle impossible to steer. Its "twin hook" design makes it more durable and tougher to defeat, while keyless locking makes it easy to use. This product is guaranteed for up to $500.00 against the owner's comprehensive insurance deductible (not valid in New York, Hawaii, Texas, or Wisconsin, where it is prohibited by insurance law). Winner International is committed to providing products to meet everyday safety and security applications. From steering wheel locks to utility and everyday locks, to other safety necessities, the Club brand name guarantees that you are buying peace of mind. Expect a product manufactured for innovative, quality security and safety created by a team you can trust that's dedicated to serving and building safer communities. Why can you expect this? It is Winner International's mission. Highly visible, this strong visual deterrent alerts a potential thief that your car is protected and inoperable. The AUTOLOCK200 is a steering wheel lock that police recommend to be the best way to deter auto theft. With auto theft on the rise it is estimated that every 40 seconds a vehicle is stolen. The AUTOLOCK200 is easily seen from outside the vehicle day or night due to the bright red coating and reflective logo. Installs in Seconds and Makes the Vehicle InoperableThe device can be fitted in seconds every time you park. It conveniently self-locks upon extending the two hooks in opposite directions, so you only need to use the keys for removal. The AUTOLOCK200 fits to the steering wheel, extends and locks to prevent the wheel from turning. The device makes contact with the windshield, door frame, console or seat, making your car inoperable. Fits on Cars, Pickup Trucks, Minivans and SUVsThe AUTOLOCK200 is perfect for cars, pickup trucks, minivans and SUVs because of the extendable arm. It adjusts to steering wheels up to 16" in diameter and can effortlessly switch from one vehicle to another. While locked onto the steering wheel, entry and exit from the vehicle will not be hindered. When removed the compact design allows for easy storage within your vehicle. Virtually Impossible to DestroyThe AUTOLOCK200 is constructed from tough, unyielding solid steel. It is resistant against sawing, prying, drilling, and hammering. You no longer have to worry about your vehicle being a prime target for thieves. A vinyl latex coating ensures your steering wheel is not damaged during use. The solid, heavy duty construction provides you added peace of mind while your automobile is parked.